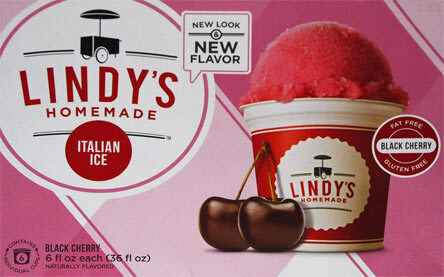 [New for 2015] I've always been a fan of Lindy's Homemade Italian Ice, but I've commented on the outdated packaging for many years..... until now. That's right, over the past several months, Lindy's finally has a more modern look. I didn't mention it sooner because I've been waiting for either the right mood to strike... or for a new flavor to appear. New cup design, it's better, if not a little too simple. 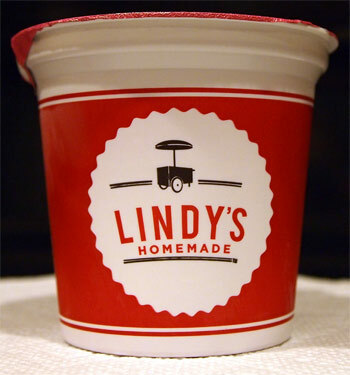 I'll be honest, while being a big supporter of Lindy's, it feels like forever since I've had some. Ok, yeah, I got nothing else right now. I'll check back with you on the next scooping. On Second Scoop: It's funny how you can leave this stuff out for 20 minutes and there's not a huge change in the consistency. I mean it's easier to scoop, but overall, still the same product. Anyway, ummm, yeah, these are fine I guess. There's nothing particular wrong with them, it's just.... it's just... I'm just unable to relate to the flavor profile. It's a little.... iunno, stemmy for my liking. It tastes more like I'm eating a cherry rather than a cherry lollipop. There's just something complex but unsatisfactory in the flavor profile. Yes, I know these say "black cherry" and not regular "cherry" so I should have expected it. In fact, I should compliment them on making something different. It's just not my thing at the moment, that's all.